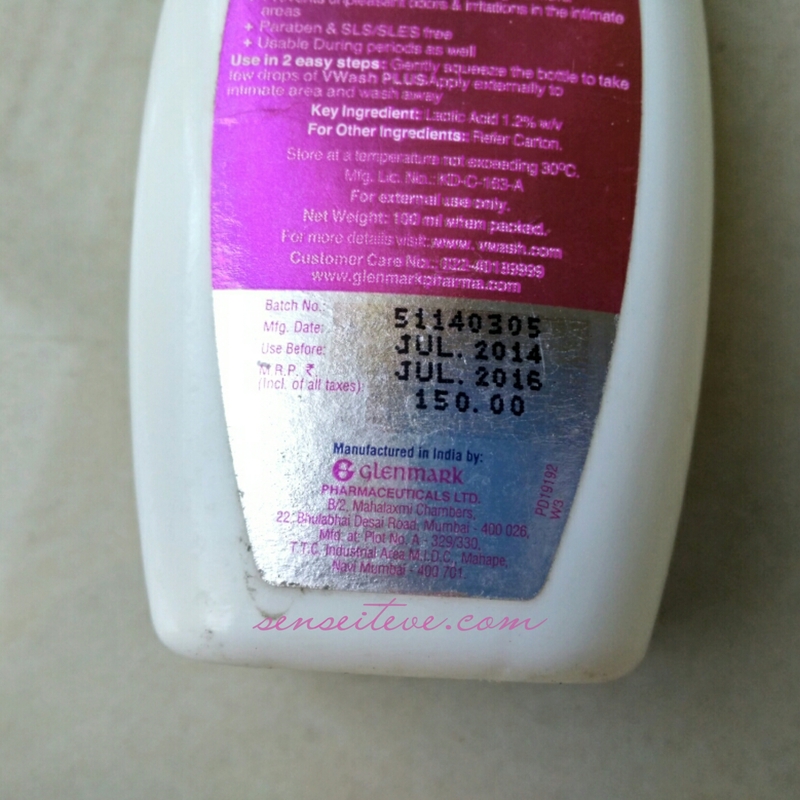 150/- INR for 100 ml. 2 yrs shelf-life. Key Ingredients – Lactic Acid 1.2%w/v. Other ingredients – Purified water, Triethanolamine Lauryl Sulphate, Ammonium Lauryl Sulphate, Cocamidopropyl Betaine, PEG-7 Glyceryl Cocoate, Phenoxyethanol and Benzoic Acid(and) Dehydroacetic Acid, Sorbitol, Hydroxypropyl Cellulose, Polyquaternium-7, Fragrance, Hippophae Rhamnoides(Sea buckthorn) Fruit Oil, Sodium Hydroxide, Tea Tree Oil(Melaleuca Alternifolia). This bottles comes packed inside a carton box having similar print as bottle which i threw in starting. 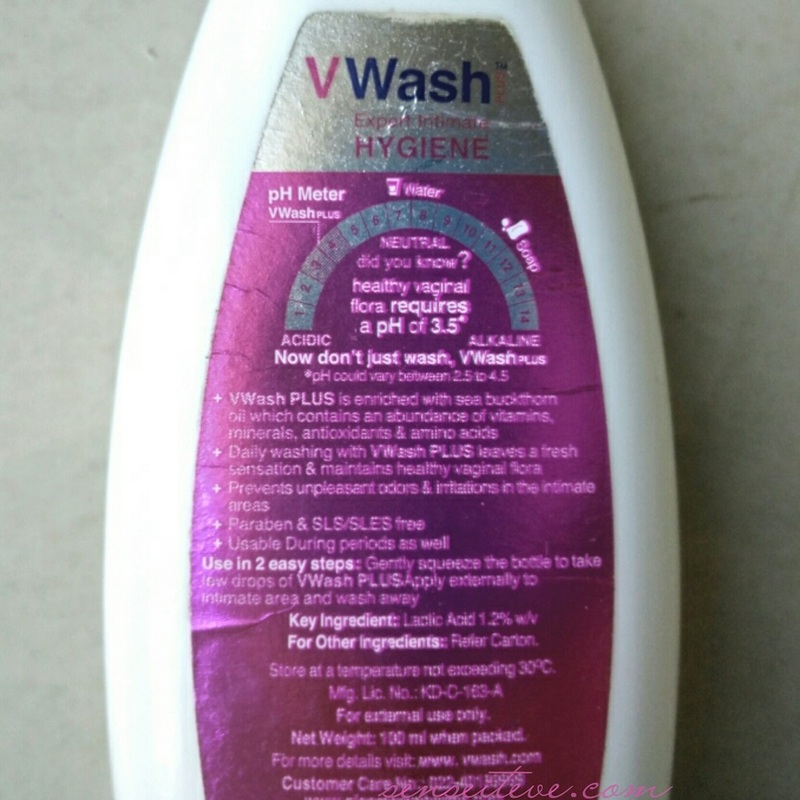 V Wash Plus Expert intimate Hygiene wash lathers pretty well and only coin-size quantity is required for single time use. I find it very runny and I end up spilling more than required. When I started using it V Wash Plus Expert intimate Hygiene wash, it caused irritation to my skin hence I stopped using it but when I ran out of my oriflame intimate wash, I decided to give it another try. I shook the bottle well before using it this time and it worked fine. It keeps the area fresh and odour free. It has mild floral fragrance. But sometimes I felt it irritated my skin and made it little itchy then I would shake the bottle again and it would work well. I read online reviews and found out that most of the ladies found it really good for an intimate wash but a few ladies mentioned that they had similar reaction to it like I did but . So it depends on person to person. 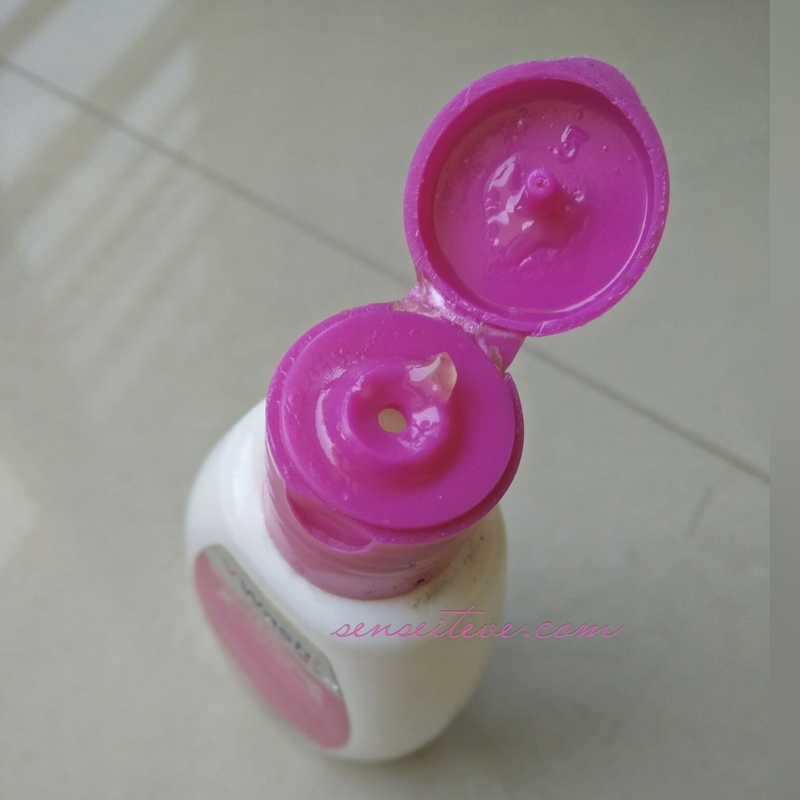 I concluded that there is something in the ingredient list which was not suitable for my skin hence my skin would feel itchy and irritated when I did not shake the solution for few days. lathers well and cleans effectively. Keeps intimate area clean and odour free. Irritates my skin and make it itchy sometimes. V Wash Plus Expert intimate Hygiene is not a repurchase for me as It irritated my skin sometimes. I found it pretty average and quite runny. I would suggest that if you try this and it makes your skin itchy then stop using it or mix solution well by shaking bottle. If irritation continues, stop using it. If you have existing problem in your intimate area, consult your gynac before using it. So Ladies what do you think about V Wash Plus Expert intimate Hygiene? have you used any of these 2 products? do let me know what are your thoughts about these? Love to hear from you. I am not sure whether this or some other brand, but I have used a sample of the intimate wash. It irritated my skin too. The oriflame one is nice. I have never used. I wanna try now. I would say try a smaller size or sample if you can get. Thank you so much Kay… It is definitely a miss for me.. Thanks for the review dear, will stay away from it. Really don’t want my skin to get irritated. That’s a bummer!!! I am using Beauty Formulas for a long time now, and it works fine for me. Though I will not recommend the gel one, because it does not foam at all, but if that is not an issue with you, you can try them out. Nice review! Sad that it didn’t work out for you. This brand is one of the most popular ones for this product. I’ve never tried any of it though. I am glad you reviewed this. There are not many options ! I think I may try thte oriflame that you and others mentioned in the comments. I tend to have sensitive skin! Thank you so much for sharing this! I appreciate how candid you were in your review. Thanks for giving others a heads up! This one suited me Anubhuti.. I have tried this & I did not face any issue. Bad that it irritated your skin. If it irritates it sounds quite bad. Vishakha@Reviewwali recently posted…How helpful is Online Mobile Recharge?